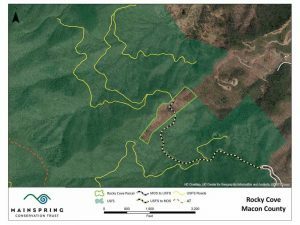 November 28, 2017 – Almost 16 acres in western Macon County will provide better access through U.S. Forest Service land after Mainspring Conservation Trust recently acquired the property. Known as “Rocky Cove,” the property is close to and in the viewshed of hikers on the Appalachian Trail. Mainspring will maintain the property until the Forest Service is able to acquire the parcel from the regional nonprofit.